Since April is National Poetry Month, I thought it fitting to share some of my favorite poetry books to read aloud this time of year. Poetry is such a fun genre for kids to explore and there are an infinite amount of great books available. Many of these authors have an extensive collection of titles in their name, so it's worth a trip to your library to check them all out, if you can! Shel Silverstein and Jack Prelutsky are old favorites from my childhood, and their style is timeless. If you haven't delved into the work of Douglas Florian, be sure to do so, especially for your students who love science and nonfiction! I love dog-related titles, but I need to give a Kleenex alert for Love That Dog (an entire BOX worth!). Dogku is an adorable tale of a dog's day told in haiku, and a very easy entry into a sometimes challenging poetry form. I use the entire series of You Read to Me, I'll Read to You in my Read with a Partner time during Daily 5. They are varied and engaging, plus easy to read so there isn't a concern with mixed reading levels in a partnership. Another series I'm getting hooked on is reverso poems, like Mirror Mirror! Read one way, it tells one point of view. But when you read it from bottom-up, it's entirely different! Be sure to check out all of the books by Marilyn Singer in this format. 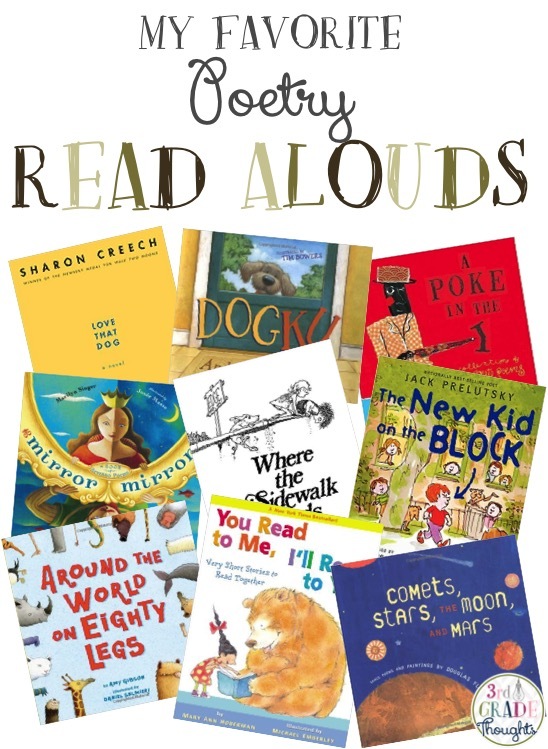 I hope this list gives you lots of ideas for read alouds for this month, or really any time of year. YES! I love Doug Florian, too ~ he's my favorite. Love Dogku. I borrowed that Mirror, Mirror book from the library, and one of my students loved it so much that it "disappeared" ~ I ended up having to pay to have it replaced. Great book suggestions!